Insert special characters into Office documents quickly. One of the eternal questions to Office Watch is about adding extra characters to a keyboard. The most common requests are for adding currency symbols like Pound £ Euro € or Yen/Renminbi ¥ but can also include the @ symbol which can, even these days, be missing from an older keyboard. You can add these characters in Word via Insert | Symbol which is fine for occasional use. It’s on the Insert tab on the far right of Office 2007 and 2010. In Office 2013 there’s a ‘Symbols’ icon that has Symbol below it. Recently used symbols appear on the gallery so you can just click on a symbol to insert. If you’re using Insert | Symbol regularly you can save time by adding it to the Quick Access Toolbar. Insert | Symbol is under the ‘All Commands’ list. That’s OK for occasional use, but what if you regularly type a character that’s not on your keyboard? 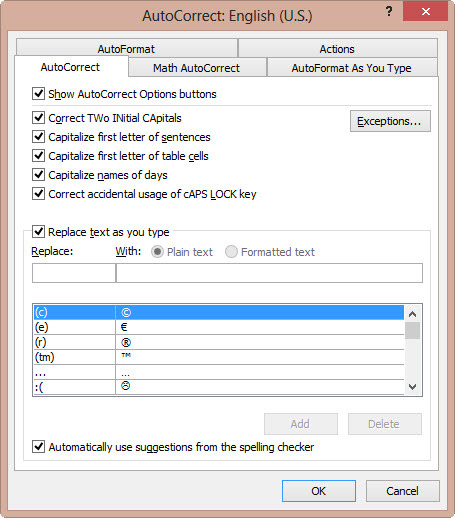 AutoCorrect has been around for many versions of Office can be used to insert special characters automatically. Office looks for you typing a string of text and automatically converts it to something else. That’s how Word converts common spelling mistakes, sometimes before you realize it. In the Autocorrect dialog box you can see all the current conversions available. Microsoft adds a lot ‘out of the box’. As you can see in this case there’s already a shortcut for the Euro symbol – typing (e) will become the symbol right away. There are also inbuilt Autocorrect items for the Copyright, Registered trademark and Trademark symbols. If that shortcut doesn’t suit you, change it to something else by clicking that line and changing the details in the Replace / With lines. The trick is ensure your shortcut doesn’t occur in normal typing. Do you have any personal Autocorrect shortcuts? Tell us about them and we’ll share your tips with everyone. But these are workarounds and only work within Microsoft Office. You might be on a public computer without Office. In some situations you really want to semi-permanently change the keyboard itself by changing an existing key or key-combination. So for the sake of completeness we’ll mention some other options that might be useful, especially if you’re away from your usual computers. The really simple option is to find an existing symbol on a web page, email or document and copy that to the place you need it. The @ symbol for emails can be found on any email address on a web page or document. This trick is handy when using a public computer in some remote place with no @ key. You can enter any character if you know the Windows code number for the characters AND the keyboard has a number pad (not the number keys across the top) with Number Lock on. Hold down the Alt key then type the four digit code. 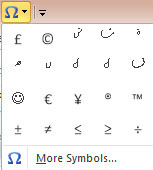 For example Alt + 0128 inserts the Euro symbol into any Windows program. which will let you map a keypress to another character. For example you could change pressing the letter e to become o – which would be useless but very frustrating as a practical joke. Even if you change keyboards, the mapping will remain because Window is making the change, not the keyboard. < More on Outlook, time zones and Worldmate > Is there a way to only search Outlook attachments?